I want to share with you just how good our Father is. He orchestrates everything for HIS good. A lot of times in life I am so busy, I miss how He orchestrates every detail. Looking over our last week in Haiti, I would have missed Him moving. I would have missed His goodness. I would have missed how Faithful He is. He started to orchestrate this week years before we ever went to Haiti. This is how I know He goes before us. A girl who lives in FL applies for PA school and gets accepted at TNU . She doesn’t know us and we don’t know her. 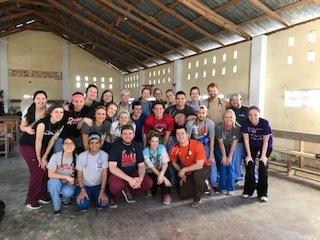 TNU offers PA Students a chance to go to Haiti over spring break to bring medical care to the community of Gonaives. She signs up for a trip and gets picked out of many who applied to GO. Her family helps with a ministry called Food for the poor and a connection is made for the team to receive medicine to take to Haiti. The team leaves Nashville and arrives in PAP but the medicines had not gotten there. Fortunately, Food for the poor donated what they could from what they had in country to fill our order (which was a lot). We ended up having to rent a box truck to transport all the medicine to our final destination in the city of Gonaives . If you know me (Kinsley), you know I planned to have everything ready for when the team arrived. I had the hotel booked , Dou Dou had the places we would be serving , the bus was rented and even the restaurant booked for the team. At the very last minute , the restaurant found out we were Americans and were going to charge us $30 per person to eat. That was way out of our budget so we ate at the only other place we knew . The pizza place. We ate there a few nights praying no one would get sick. The food was okay but I was ready for some good Haitian food. By eating at this restaurant we saved $424.00 . This amount matters, so just hang in there . 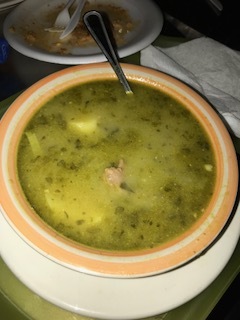 P.s Here is a picture of my green soup from the restaurant. Yep it’s green and no I did not eat it . We met a really sick baby day 2 of clinic. He needed to go to PAP right away and get tests done. Our team members that came in contact with him went ahead and started taking medicine to help not catch what we thought he may have. We sent him and his mother with $100 to get tests, rent a room, and food. She was to call us the next day with how much more the tests were going to cost. One thing Charlie and I have said from the start is we truly believe in helping other organizations. We both agree it is better if we all work together. This past week we were able to support 2nd story goods by shopping at their gift shop. Our team bought a lot of cute merchandise and I was later told me the team bought exactly what was needed to make payroll for the week (Yep God is faithful). The owner and I talked for awhile and I really wanted some good food, so we asked him if there was anywhere else we could eat besides the pizza place. He tells us a place and gets it all set up. I was excited to eat somewhere else the next night but God was already moving, I just didn't know it. The next day we loaded the bus and drove 3 hrs away. People were getting sick and you could feel the spiritual darkness. In the midst of praying for protection , there was a light mist of rain that starts to fall. The Lord was reassuring us that His blessings were being poured down on us. We get to the clinic and someone gets stuck by a needle with no way of knowing who the needle was used on. (Fear sinks in) But in the midst of all the chaos- it starts to rain again . I was standing in the middle of the church and I started to feel the rain on my arm. I am reminded again that God is in control and He is raining down his blessings. I got in touch of Dr.Anji Wilson and she posted on Facebook asking if there are medicines in country for the girl to take who got stuck by the needle . We are up on the mountain with no way of knowing if anyone responded back to her post. Our dinner reservations were for 6:00pm but because it took us 3 hrs to get to the clinic and not 2 we had to call the restaurant and tell them we wouldn’t be there until 7:00 pm. This is not a coincidence, this is what I like to call the Lords timing. We arrive at the restaurant , walk in and there are two American ladies sitting at a table. One ask me where we were from, I told her Nashville . She asked us what we were doing this week and I told her a medical clinic. She said ,"you wouldn’t happen to be team looking for medicine for someone who got stuck by a needle?" I could have cried . Yes , yes we were. On top of a mountain we prayed for God to provide. On top of a mountain we trusted God protection. On top of a mountain we still second guessed our MIGHTY God. Within a few minutes we had the medicine coming to us the next morning . (God provides - I don’t understand why I question or worry) Not only were the medicines coming but a friendship was made. The next morning Julie brought the medicine to us and it turns out she lives one street from the church we were doing clinic at. Like, really? What are the odds ? Again I wonder why I ever doubt Him. We also got a call from the mother who we sent to PAP with her baby. All the tests were going to cost $300.00. Do you remember the amount from earlier? So we are up to $400.00 for this family. Some may also be asking why she was given so much because $300.00 is a lot of Haitian money. But we had them do 5 different tests. We needed these results to protect our team. We needed these tests so we would know how to help him and his family. By the end of the week, we gave them another $20 for food and transportation. The total given to this family was $420.00! My mind is blown by how God works out all the details. We ate crappy food for a reason. I didn't understand at the time, but God knew exactly what was going on. We later learned some shady things happened with a pastor we were working with and my heart was broken but the Lord was still working . In the midst of the crazy , in the midst of heartache, in the midst of confusion - God was still working . While I am standing there questioning, He was still working everything together for His good . As we were getting ready to leave, the bitter side of me says we aren’t giving anything to anyone else in XYX (That is where is the heartache and shady things happened-- I am still human and bitter at times). So I reached out to Julie and asked her if she wanted some American goodies and medical supplies . Of course she said yes and headed over to pick it up. In the midst of me being human - He is still moving and He is still working all together for his good. Julie finds a full bag of goodies for her family and we head to the room where the medical supplies were kept. Again, these are the ones Food for the poor sent for us. When Julie and Alex walked in they saw a stroller. Not just any stroller. It is a stroller they had been praying for. You see, they are in the process of adopting a baby from Haiti who has down syndrome. They have been through multiple strollers with him and needed a stronger stroller which is built for him. This stroller in the room was the exact stroller they needed. They had been praying for the funds to purchase it because the stroller costs over $2,000.00. We also had tons of pull-ups they needed for him. Eyes started to water and we just sat back and watched God move. We stopped and lifted their family up in prayer. We prayed for protection, spirits to be renewed, and thanked Him for providing for this family. I want to get this..... THEY HAD BEEN PRAYING FOR THIS STROLLER. THIS EXACT ONE. OUR MEDS DIDN'T MAKE IT IN SO FOOD FOR THE POOR JUST GAVE WHAT THEY COULD. AND WHAT THEY GAVE WAS AN ANSWER TO A PRAYER. God is still moving... He still works everything for HIS good. We just have to stop and recognize He is in control. We have to be intentional about seeing the pieces move in and around our lives. We have to see He goes before us. We have to be thankful for the answered prayers. We have to STOP and reflect on HIS perfect plan. The plan may not look like what we thought it should have, but His plan is so much better. In closing, the team saw and treated 780 people. These individuals were prayed over and we gained 7 new believers. 7 lives were forever changed for eternity. In the midst of heartache I still saw the LORD moving. I saw the Lord provide. I saw Gods timing is perfect. I saw HIS plan is way better than my plan. I saw prayers being answered. I felt His presences whispering blessings and reassurance through drops of rain. He is a good good father.